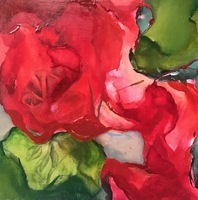 Norwalk, CT - The City of Norwalk Parking Authority’s Maritime Garage Gallery’s latest exhibit features art that brings a bit of spring to winter, through color. “Migrating Colors” runs from February 19 through May 10, 2019 with an opening reception on February 19th at 5:00 pm. The Maritime Garage Gallery is part of the Parking Authority’s “Art in Parking Places” placemaking initiative, an effort to support art in parking spaces. The gallery is located at 11 North Water Street in the SoNo district of Norwalk. It is free and open to the public from 9:00am -5:00pm, Monday through Friday. For more information, call 203- 831-9063, or visit www.norwalkpark.org/public-art.